It is over ten years since the Hotel Iveria saw those days - the hotel is now home to more than 1000 refugees who fled the war in Abkhazia. It seems a long time since Georgia was once the place where wealthy Muscovites spent their summers. From the Black sea coast in Abkhazia, once known as the Russian Riviera, to Tbilisi and the mountains that cut the Caucasuss in half, it was without doubt one of the jewels of the Union, lost to independence during the Soviet break up. The war in this region began after Georgia broke away from Russia. Abkhazian authorities decided to pursue their wish of becoming an autonomous republic and used the opportunity of Georgina independence to do just that. The regions population was nearly 50% Georgian, 17% Abkhazian and the rest made up of Russians, Greeks and some Armenians. Out of this relationship grew one of the worst spectacles of war. Neighbours and friends turned on each other, fuelled by political propaganda. The ethnic Georgians became the main focus of aggression and were forced to flee. Attacked in their homes and in the streets, many were killed as they tried to escape. Others found their way across the boarder to Russia. Some left by boat, sailing around the Black Sea coast to the Georgian town of Batumi, but the majority found their way, on foot and with only what they were wearing, hundreds of miles across the mountains to Tbilisi, the capital of Georgia. Abkhazia has always been a part of Georgia but like so many regions within other countries it has its own culture and beliefs. Abkhazian religion in Georgia is refered to as "heathen", a form of idol worship. The year long war in Abkhasia resulted in more than 100,000 deaths, both Abkhasians and Georgians, and forced over 350,000 people to leave the region to claim refugee status elsewhere. Today, Russia continues to flout international law by keeping a foot-hold in this place by granting people living in Abkhazia Russian citizenship. Russias love for Abkhazia is fuelled by more than just sadness over loosing a fine holiday resort. The break up of the Soviet Union has weighed heavily on Moscow and losing control over territory has been one of Russias largest personal and physiological burdens over the years. So to loose the strategic position that Georgia once held must have been especially painful. Ten years on and Abkhazia is still a tense and unstable place. Monitored by the UN and patrolled by Russian peacekeeping troops, it is still an unsafe place for Abkhazian Georgians to return to. Scared of hostility and persecution most just dream of returning to their homes. It is unlikely even if they could return to a peaceful homeland that they would be able to once again live in their own homes or farm their own land. Russians and Abkhazians have taken much of what was once theirs and are unlikely to just hand it back. Georgian Abkhasians do not wish for any more fighting. For the refugees living in Georgia things are very difficult. There is no real way to show themselves as one group as they are spread widely across the country and there is a very real variation in how well the different communities have faired and how they have assimilated into the wider Georgian society. After ten years cracks have begun to appear in the local populations tolerance. Many refugee communities are quite successful in Tbilisi, taking advantage of the available jobs - of which there are very few. Their community has been forced to become insular. A constant wish to return home to Abkhazia has in many ways been the cause; the consistent promises, that one day unity would be realised has discouraged people from integrating. At the main market place this mentality is apparent. Administered and used by Abkhazian refugees, the indegenous Georgian population are forced to accept the business arrangement. It is a place not welcoming nor patient of strangers. After all this time people are still very weary of any outsiders. In Tbilisi itself there are over 100,000 refugees from Abkhazia who, when they arrived, were given plenty of help to settle. The city hotels were made available, as well as many blocks of flats, to accommodate the influx. To this day refugees are still there, still given their electricity, water and gas for free while others in the city struggle to pay their bills let alone own find work. For the people of the Iveria hotel things are not that simple; they are still a people without a homeland and however much they have achieved since arriving with so little, most still dream of going home. A room, that in some cases shelters as many as six family members, was never the long term plan but with the next generation now becoming part of Tbilisi life and another being born into it, the dream of returning home will slowly be seem less and less achievable. I met Mzia Tsaava in February 2003. She lives on the ninth floor in the old dormitory block of Tbilisis now dilapidated Industrial College. The building, similar to that of the Iveria hotel, has been used to house refugees from Abkhazia for ten years. It is in an appalling state of decay, the single small lift that serves all of its 800 occupants, grinds and grunts as it slowly makes its way up to the ninth floor. Without a ceiling, the lifts worrying state of repair is plain to see. More often than not this ancient piece of machinery is out of order leaving only the stairs, another one of this building's many tricky obstacles. The lift jumps to a halt and the other passenger smiles as he forces open the doors. I pass four young men playing a game of cards as I make my way down a dark corridor that leads to Mzia's room. The walls are filthy, cracked and crumbling and many of the old dormitory doors are missing, replaced with old blankets. Pipes and wires hang uselessly from the walls and the ceiling and every now and again I can feel water dripping on my head. The door is opened and I am greeted with great enthusiasm. Mzia Tsaava has jet-black hair and dark brown eyes. I estimate that she must be in her late forties, nicely dressed, with a well-practised and warm smile. Her dormitory room is small. In the cramped entrance hall there is a kitchen to the left, no larger than five foot square. In her other and only room, there is a bed at the far end. A sofa and chairs, set around a small table and just a few other necessary pieces of furniture, take up the rest of the space. The room is simply decorated, warm, clean and homely. We sit down to eat and drink a generous spread of traditional Georgian food and wine and are joined by a number of her neighbours. "I arrived here ten years ago to the day". She began. " I came with nothing, only the clothes on my back, alone and without my husband, he was a police man and was killed in the fighting at Sokhumi by Abkhazian soldiers." She pauses as all in the room bowed their heads and then raise their glasses to remember her loss. "I walked here from Sokhumi with many others', she continues. "When we arrived we were brought to this building, there was nothing here. There were no windows, nothing on the walls, no furniture. It was filthy. Just nothing." "It was a terrible war, friends that I once had turned on me and my family, forcing us out. All I have now are my dreams of my homeland and my dreams of returning, I hope it will be so one day. Children are our hope". She pauses. "I love the children. I teach the infants and young who live here in this place. I was a teacher in Abkhazia and I am now a teacher here to, so I tell them of their homeland and that they might one day see where they came from". Mzia Tsaava is one of the lucky ones. She is not starving, she is able to work and she is able to find happiness in the children she teaches but it will never be enough. When you only live a days journey from the home you wish you could return to how could it be so? I took an over-night train west, to the run down town of Zugdidi on Georgias border with Abkhazia. It is here that one can really begin to get a better understanding of how serious the problem of Abkhazia is for its people who are so desperate to return. Zugdidis population is poor and lifeless. 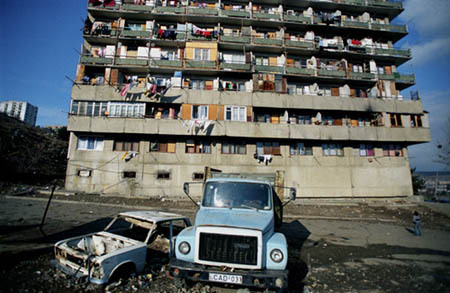 Its walls are crumbling and crime here is a way of life for many. Twenty-six murders in the last year have gone uninvestigated, thieves and pick pockets roam the streets unhindered by authorities and politicians, ignored by Tbilisi, line their pockets and make their own rules. This is Georgias "wild west". Zugdidi is home to more than 120,000 Abkhazian Georgian refugees but the story here is very different to that of Tbilisi. These really are a forgotten people. Living in the crumbling ruins of ex-soviet factory buildings, it has been over five years since the UN or any other organisation looked-in on these people. Three miles out of town and across the Inguri Bridge lies the Gali district of Abkhazia. Some of the fiercest fighting of the war happened here and to this day it is still considered a conflict zone watched by the eyes of the UN and Russian peacekeeping forces. Both are usually at loggerheads with the Abkhazian military who to are supposed to uphold the law. Armed gangs and lawless groups of criminals rule this land. The trade in stolen cars, drugs and arms is well known but little ever seems to be done about it. Every day, with special passes, thousands of the refugees are forced to run the gauntlet of the oppressive Russian peacekeepers and the criminal gangs that roam freely. Since the war ended these people have been walking the many miles from their wretched make-shift homes, to their land and livestock across the border, every day under constant threat of reprisals. In ten years many lives have been lost, many forced to give up their land because of the constant threat of danger. Opportunists who prey on these peoples' vulnerability, now occupy the homes they once lived in. Conversation with people here is brief, for guests are a great rarity and usually not entirely trusted. Many feel Georgia should take back Abkhazia by any means necessary and vent their anger on the politicians for ten years of broken promises. Still they dream and in a small room on the ground floor decorated with cigarette packets and pictures torn from magazines an old lady, maybe seventy years of age, sitting on an old prison bed smiles as she says in a quiet and relaxed voice, "One day I will return to my home Abkhazia. Even if only to sink beneath the ground".